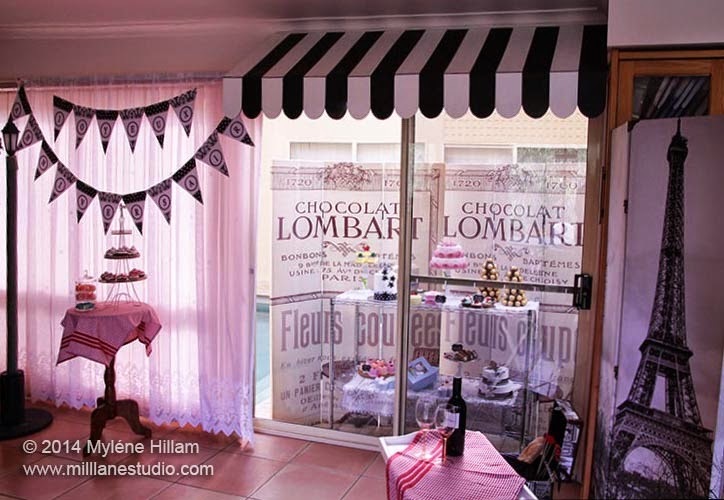 The French theme continues on my blog today as I show you how to make a canopy for a quaint little shop front. I created a faux pâtisserie for my sister's birthday and this was just the finishing touch to set it off. 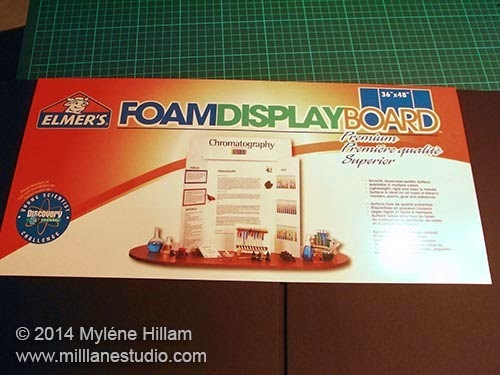 I started out with two black tri-fold foam core display boards - the type used for science fair projects. 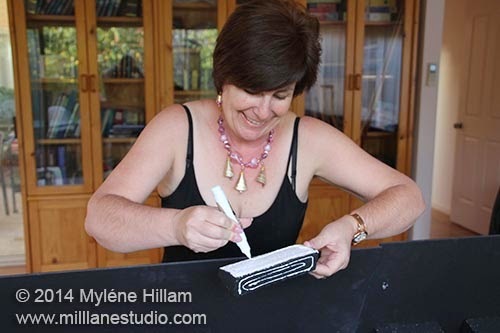 It would be just as easy to start with white core board and then you could colour it any colour you want but black and white worked perfectly for my theme. 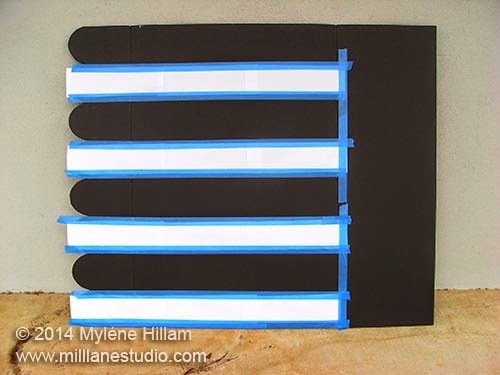 To create the scalloop, tape a bunch of papers together to form a piece of paper the same length as the width of the core board. Fold the paper in halves, quarters and then eighths. 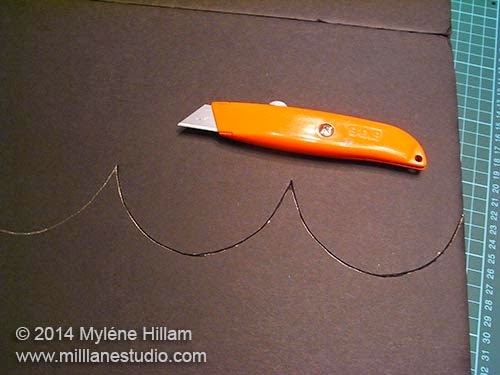 Draw a scallop and then cut it out. 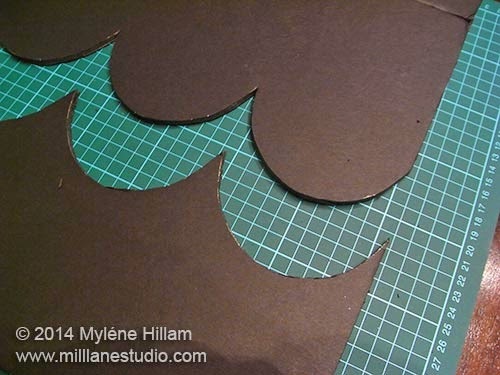 With the board still in the flat position (sides folded in), place the pattern along one of the folded edges and trace around the scalloped edge. I used a white pen so I could see where to cut. 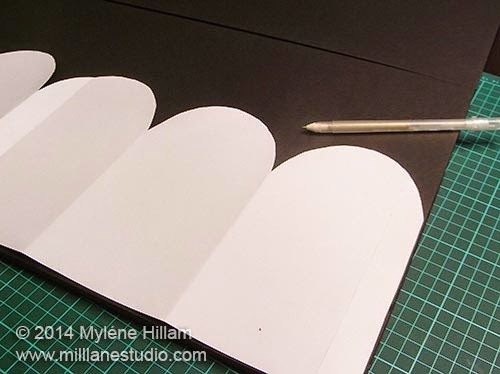 The easiest way to cut foam core board is with a Stanley knife. Run the blade along the scallops in several passes until you have cut right through to the other side. 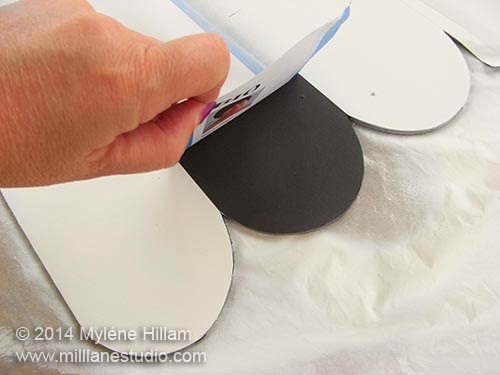 Now you need to mask off the areas you want to keep black (or white if you're using white core board). 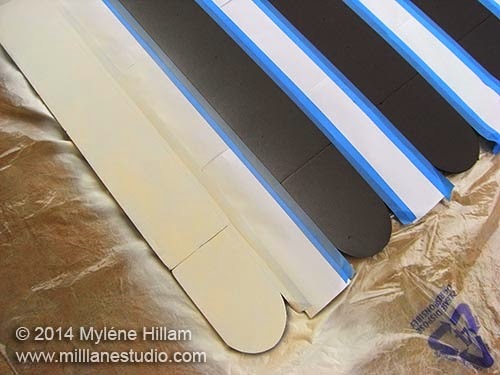 Use low tack painter's tape to secure strips of paper along every other scallop, making sure that you're painting the outside and not the inside. Also mask off the other end flap (not shown in this photo). 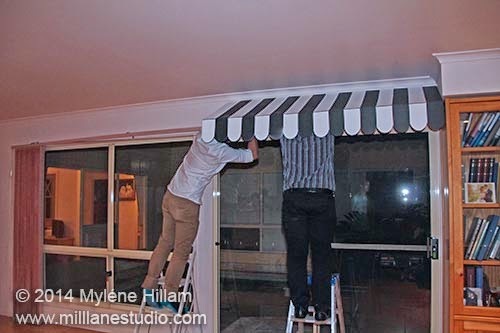 After doing the first canopy, I realised that it would be much easier to secure to the wall if the end was not painted! I tested a couple of spray paints and ended up using a spot marking paint that adhered to the board well. 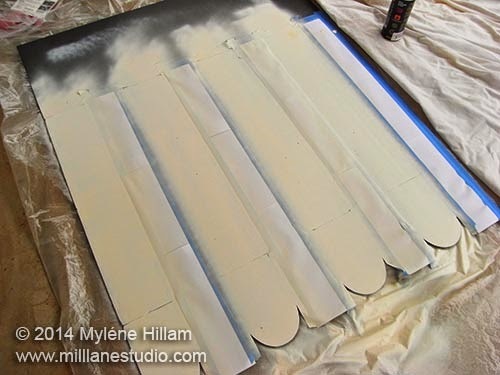 Not all paints adhere to the core board so spray a test patch on your scallop offcut first. When you are happy with the paint, spray the stripes in long sweeping motions aiming for even, but light, coverage. Let the paint dry before continuing. 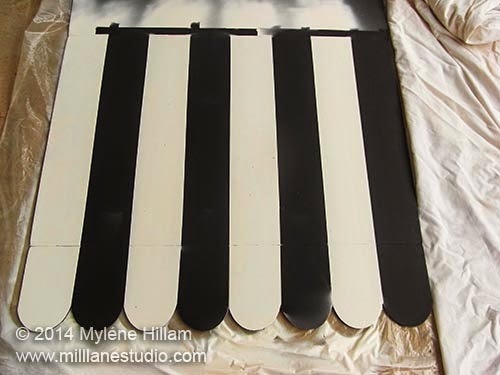 You will have to do at least two coats and maybe even a third one if you're spraying white onto black! 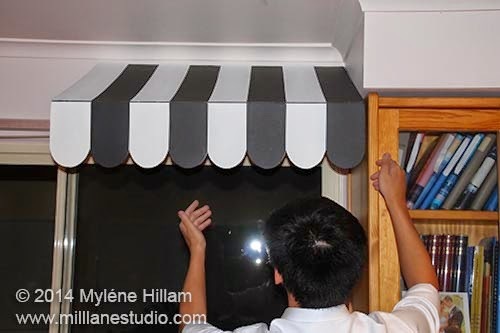 Once the paint is completely dry you can carefully remove the strips of paper to reveal your striped canopy. Looking pretty good! I needed two canopies for the double doors I had to cover but even a single one would look great above a regular doorway. .... and glue the wedges in place. 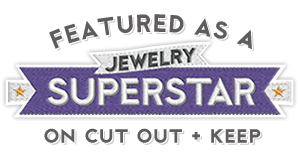 Get some extra hands to help mount it on the wall. We used 3M Command velcro strips so that we could remove it without leaving any marks. With the first half of the canopy up, we held our breath to see if it would stay in place! And it did! 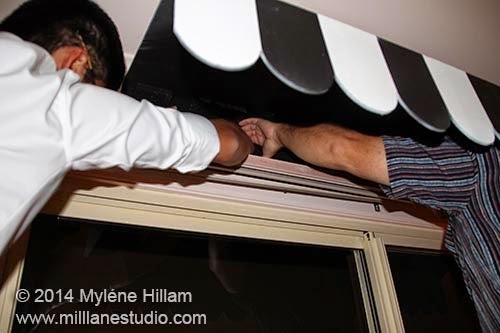 So the boys got the second half of the canopy up in no time. And here's the window, dressed as a French Pâtisserie. The canopy really brings the whole theme together. 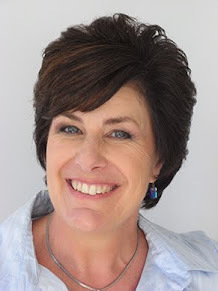 Now that the stage is set, it was time to have some fun!